Liverpool are near to bring back the EPL title and keep on fighting for Champions League title for the second year in a row. Despite the fantastic results, there is one thing that Merseyside club still needs to improve. Last season, when Liverpool was playing a dynamic football with counter-pressing, they reached to Champions League final and finished 4th in domestic league. However, many clubs get used to play against Reds. Last matches, including the derby against Everton and European clashes against Napoli and PSG, have shown that Liverpool now needs a Philippe Coutinho type player, who can move between the lines and create chances for his teammates. Now that role is given to Xherdan Shaqiri, however, Switzerland international feels comfortable, when playing from right or left. We have found the possible solutions for this problem. Here are 2 candidates that can help Jurgen Klopp be more variative in long season. Real Madrid star has bad relationship with newly appointed coach Santiago Solari. Several European clubs, including Liverpool, are monitoring his situation at Los Blancos. Isco is one of the most creative midfielders in the world. He is not as mobile as Coutinho, but his style is similar to Andres Iniesta’s style. Liverpool could have definitely been better against defending teams with Isco in the squad. He can create chances for Mo Salah, Sadio Mane and Roberto Firmino. Bobby, therefore, can more concentrate on his False 9 role, rather than moving back and trying to create from deeper positions. 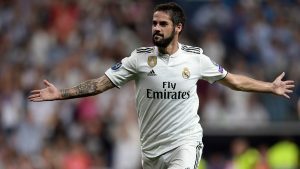 Isco has contributed 10 assists and 9 goals last season.